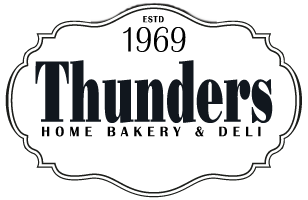 Thunders Bakery endeavors to collect, store and use your personal data only with your knowledge. The collated information may include your name, address, telephone number and email which will be used to contact you regarding your participation with our service. If you choose to provide us with personal information it will be used in support of the intended purposes stated at the time at which it was collected, and subject to any preferences indicated to you. This information which we store is to aid the efficiency of our service to you and is designed to be compliant with the disclosure requirements of the Data Protection Act 1998. If you require any information or wish to obtain the personal data we have stored please contact us on the details provided on site. When purchasing goods/services on our site your credit and debit card details are stored by Payzone who is our online payments provider. These payment details are stored in compliance with the PCI: DSS laws therefore they remain encrypted and are not passed on to any third party or used for any payments without your consent.